Makers of iconic lighting, furnishings and tools for productive living. Rejuvenation was founded in 1977 in Portland, Oregon and began as an architectural salvage shop rooted in history, architecture, and great design. From the front porch to the back door, our lighting, hardware & home goods are based on the best of the past, designed for today and made to last for the future. Rejuvenation products are sold exclusively through the company’s catalog, retail stores in Portland, Seattle, Los Angeles, Berkeley, Palo Alto, and Atlanta and via our website at rejuvenation.com. Rejuvenation is a member of the Williams-Sonoma, Inc. portfolio of brands. *Authorized Hinkley Lighting Dealer* Accent Lighting is locally owned and has been family operated since 1996. Accent Lighting is Oregon's ONLY showroom with lighting consultants CLC certified by The American Lighting Association. 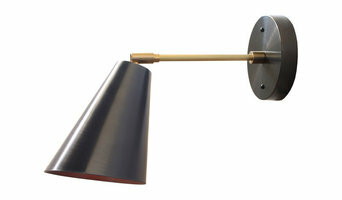 Both our Lake Oswego and Redmond, OR locations feature the newest trends in lighting. Visit our award winning showrooms! We are proud to have received The Showroom of the Year award for exceptional community service, North American Showroom of the Year Winner in category and The Arts Award. Eleek's artisan designers and patternmakers manufacture decorative lighting and other metal building products like hardware, tiles and sinks using recycled materials and low energy options. Eleek has created a new model for manufacturing in America. Not only are Eleek products made entirely in the USA, but Eleek also buys more than 80% of its supplies and vendor services from within 50 miles of its shop. Manufacturing and purchasing locally creates living wage jobs and spurs the economy. Eleek is helping to create a prosperous economic future one light at a time. Sustainable and handmade in Portland, Oregon! I am a designer at Ethan Allen in Beaverton and I also do the visual merchandising of the showroom floor. I work with a plethora of clients and varying styles. It's very important to listen to your client's needs and their vision. That way we create the best outcome for the space you are working on. I love my job and would love to help you with your current project. Drop into the design center and ask for me! We provide architectural lighting design services for commercial and residential clients. Check out our website for more information and for examples of our work. Kayla Burke Design brings a creative flare to light, nature and handcraft. Fusing these elements together to create One of a Kind Lighting that will light up your space. All walnut is rescued from the Willamette Valley, OR. Each piece is handcrafted in Portland OR and embraces the natural characteristics of the wood. Kayla Burke has a diverse background in Architectural Lighting Design, Custom Lighting Design, Product Development and Interior Design. Contact Kayla Burke Design to light up your space or to design your one of a kind light. Most companies like to brag about how they've changed over the years; we don't. One of our greatest sources of pride is the fact that we're very much the same store we were in 1954 when R.J. Grover opened the very first store. Since then, our focus has been selling only products that are reliable and trouble free. Our products may have changed with the times, but our approach to personal service hasn't. Sure, we've grown to seven stores around the Pacific Northwest, but they are seven hometown stores that are part of the local community. Our main focus is, was, and always will be: service. That's why we are a favorite of do-it-yourselfers. Our product knowledge and willingness to take the time to show our customers how best to use our products makes all the difference. It's true that we are popular with a lot of contractors, but you get the same quality service even if you just need a light bulb! Our amazing service requires having pleasant, well trained, long-term employees and doing all the little things: •We help you load large items in your vehicle •We actually count your change back to you. •During business hours you won't get voice mail, we answer the phone. •Our service counter is in the front of the store where you can always get one-on-one service. As the world gets more corporate-conglomerate-mega everything, we're glad to be a little piece of yesteryear. 12535 NE MARX ST PORTLANDOR97230. Lampundit lighting is professional on vintage and industrial style lighting, we are committed to providing you high quality products with competitive and reasonable price. No matter what your decorating tastes are, we'll be sure to find a lighting product to match. The Lamps Plus Beaverton-Portland store is located just east of the 217 Freeway, at the corner of SW Scholls Ferry Road. We are on the north side of the street, across from Washington Square Mall. Think about how you plan to use each area of your Vancouver, WA home. It's important to communicate to your Washington lighting designer which space will be used as an office and which will be a media room, for example, as these will require very different lighting methods. In addition, consider how you'd prefer to control the lights. Lighting technology today includes dimmers, sensors, photocells (that let lights react to the amount of daylight in a space), programmable scene controls (that let you program different settings for varied lighting) and whole-house lighting controls (that let you control all or a portion of your home's lights from one source), allowing you to tailor your lighting controls however you wish. Find a lighting designer on Houzz. Narrow your search in the Professionals section of the website to Vancouver, WA lighting designer. You can also look through Vancouver, WA photos by style to find a lighting design you like, then contact the designer.